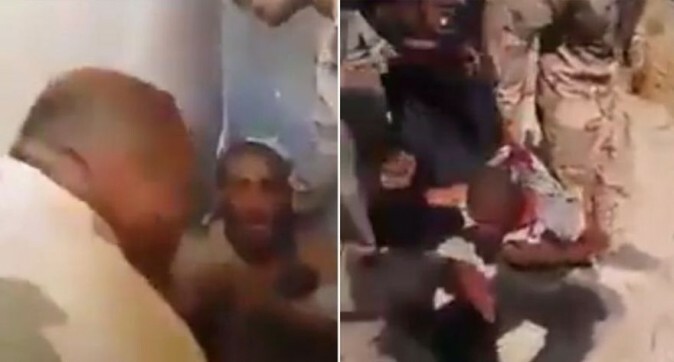 A distressing video posted online this week shows the executions of alleged fighters loyal to the ISIS terrorist group—at the hands of Iraqi soldiers. In the clip, the soldiers are seen throwing the ISIS terrorists off a cliff and shooting their bodies as they hit the ground, according to the New York Post. Iraqi officials are now investigating the clip after it was posted on Twitter and taken down. Brig. Gen. Yahya Rasool, who is a spokesman for the Joint Operations Command said they’re “keenly observing and following what is being published on social media outlets about the conduct of a number of our soldiers, or those who are wearing uniforms,” as reported by the Independent (which posted the graphic video). Specifically, according to the Post, an alleged ISIS fighter is dragged by soldiers to a cliff and is then dropped at least 30 feet. The soldiers then open fire on his body when he hits the ground. The execution is reminiscent of methods used by ISIS terrorists during their reign over the area. A screenshot of the video was uploaded to several news websites. 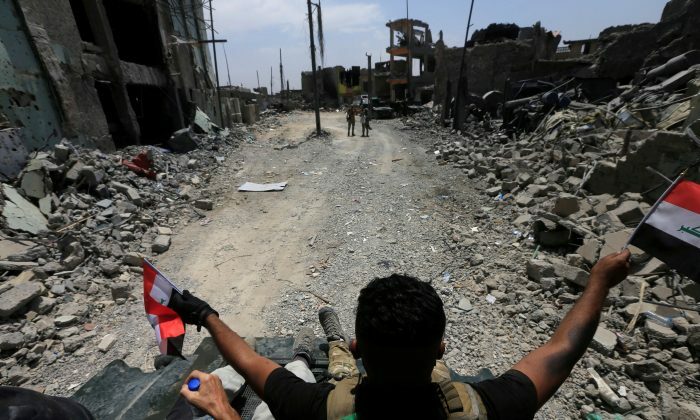 According to the Guardian, the video was filmed in Mosul, Iraq, where Iraqi soldiers have mostly retaken the city that was controlled by the terrorist group. 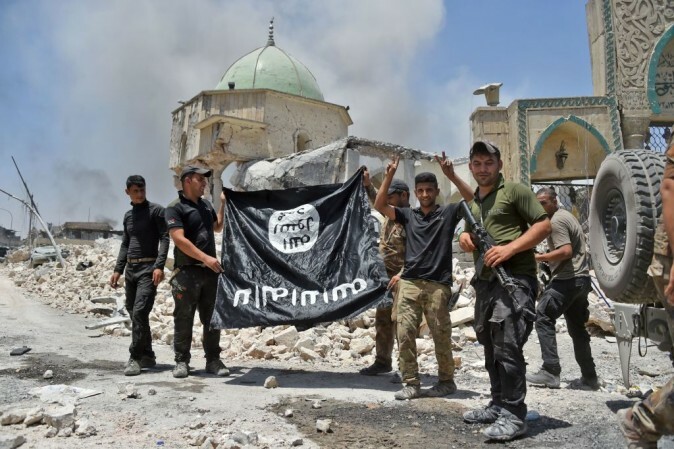 A member of the Iraqi Counter-Terrorism Service (CTS) raises the victory gesture as others hold upside-down the black flag of the Islamic State (IS) group, outside the destroyed Al-Nuri Mosque in the Old City of Mosul, after the area was retaken from ISIS, on June 30, 2017. Wille also raised concerns over Iraq’s establishment of a tent camp by Mosul used for ISIS suspects’ family members. “So-called ISIS families should be sent to receive psychological and ideological rehabilitation,” HRW added. An Interior Ministry spokesman told the Guardian that if the videos are real, the perpetrators would be brought to justice. 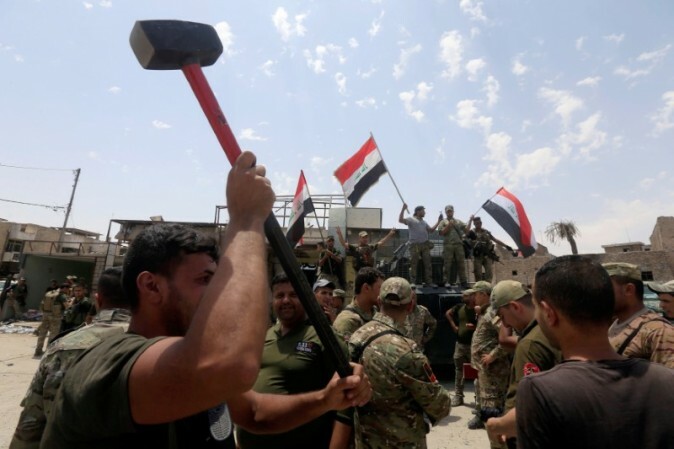 “These abusive acts are war crimes and are sabotaging efforts to promote reconciliation in areas retaken from ISIS,” explained Lama Fakih, deputy director of the Middle East and North Africa portion of HRW.